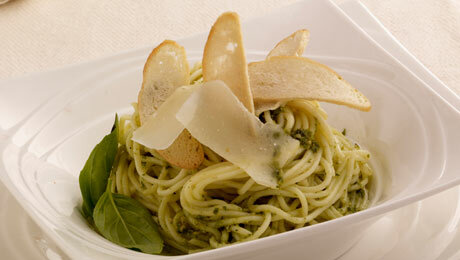 Using the versatile flavours of basil and parmesan cheese, this dish is quick to prepare and delicious to eat. Cook the spaghetti in lightly salted water according to the packet instructions. Drain the spaghetti and add the pesto. Garnish with some freshly chopped basil. Serve sprinkled with grated Parmesan.